Can I deduct my mileage and my other vehicle expenses (gas, repairs, etc)? The IRS only allows you to use one method: the standard mileage rate or actual automotive expenses like repairs, gas, and maintenance. However most users enter both their vehicle expenses and mileage in Hurdlr, because Hurdlr is smart enough to choose the most advantageous method for you when calculating your tax estimates. 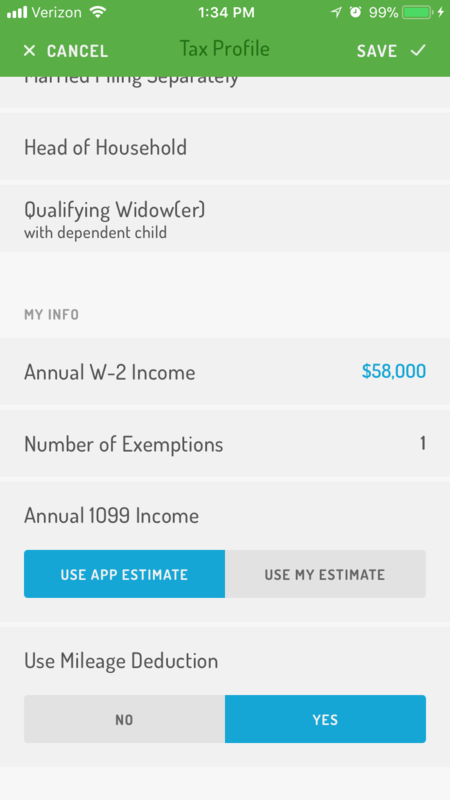 By navigating to the Taxes screen and tapping on Tax Settings, you can change "Use Mileage Deduction" to No or Yes, that way you can see whether you’re better off using the mileage deduction versus using vehicle expenses at any point in time. Disclaimer: The information contained here is provided for informational purposes only and should not be construed as financial or tax advice. It is not intended to be a substitute for obtaining accounting or other financial advice from an appropriate financial adviser or for the purpose of avoiding U.S. Federal, state or local tax payments and penalties.